Dear Readers, we are presenting Daily Current Affairs for All Exams- 8th January 2017. 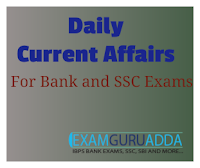 Daily Current Affairs and General Knowledge is very helpful for IBPS Bank Exams, SBI , RBI Assistant,NIACL, SSC and Railway Exams. 1. A special skill development program - ‘Pravasi Kaushal Vikas Yojna’ for Indian youth is planned, said Prime Minister Narendra Modi. 2. Addressing the 14th edition of the Pravasi Bharatiya Divas at Bengaluru, Modi the new skill development scheme is aimed at Indian youth who wish to seek jobs abraod. 1. Pakistan’s former Army chief Gen. Raheel Sharif (retired) was appointed head of Islamic Military Alliance to Fight Terrorism (IMAFT), a Saudi Arabia-led military coalition of 39 nations. 2. The appointment was confirmed by Pakistan’s Defence Minister Khawaja Muhammad Asif as both the government and the Army allowed Gen. Sharif take charge of the alliance. 1. US president-elect Donald Trump has named retired senator Dan Coats as his National Intelligence Director. He is former senator from the state Indiana who had served on the Senate Intelligence Committee. Coats will need the Senate confirmation for his appointment and shall replace James Clapper. 2. His appointment comes at the after release of declassified US intelligence report mention Russia’s influence in the 2016 Presidential Election. The office of US National Intelligence Director was created after the September 11, 2001 terror attacks to improve coordination among US spy and law enforcement agencies. 1. Former human rights lawyer Nana Akufo-Addo (72) was sworn in as new president of Ghana. He had won the December 2016 elections by defeating incumbent President John Dramani Mahama in the first round by winning 53.83% of the votes. 2. Mr Akufo-Addo’s inauguration represents the latest peaceful handover of power in Ghana. Previously he had served as Attorney General from 2001 to 2003 and as Minister for Foreign Affairs from 2003 to 2007. Ghana, the western African country is major cocoa and gold exporter. 3. At present it is facing economic crisis and is half-way through a three-year aid programme of the International Monetary Fund (IMF) to fix an economy dogged by high public debt and inflation. 1. Veteran All India Forward Bloc leader and former West Bengal minister Saral Deb passed away following a prolonged illness. He was 82. He was a six-time state legislator, winning from Barasat constituency of North 24 Parganas district. 2. He was the state Library Minister from 1977 to 1982 and also had held the Cooperative portfolio from 1982 to 1987. 1. Sania Mirza, Bethanie Mattek-Sands wins 2017 Brisbane women’s doubles title Brisbane International women’s doubles title. In the final match, top-seeded Indo-American duo defeated second-seeded Russian team of Ekaterina Makarova and Elena Vesnina by 6-2, 6-3 score. 2. This was Sania’s first title of the season but ended her 91-week reign as the world No.1 doubles player in the WTA rankings. This top rank position was taken over by her partner Bethanie Mattek-Sands.